With spectacular city and Union Station southern views, this large one bedroom home has an open floor plan including an office nook, a kitchen island and extra half bath. Designer finish package: hardwood flooring, solid maple cabinets, Quartz countertops, marble flooring & shower in master bathroom and Bosch appliances including gas cooktop. 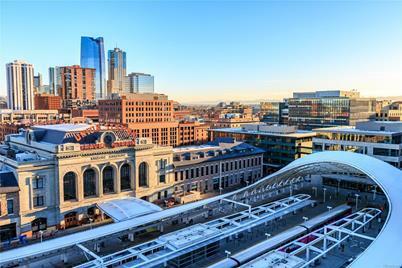 Situated at the heart of the acclaimed Union Station neighborhood and across the street from flagship Whole Foods. Ground-floor retailers include A Line Boutique, Kaffe Landskap, Blo Dry Bar, Pure Barre and more. Exclusive resident amenities include 18th-floor pool deck/hot tub, fire pit, club room, 24-hour staffed front desk, fitness room, owner's library and garden terrace. The Coloradan offers direct access to the train to the plane and Denver's hottest restaurants including Tavernetta and Mercantile. Parking for you and guests. Estimated to deliver the end of this year. All information provided is representative of The Coloradan. Driving Directions: To learn more please schedule an appointment to visit our sales center located in the Triangle Building 1550 Wewatta Street 2nd floor, Denver, CO 80202. Appointment hours are: Tuesday; 1pm – 5pm, Wednesday – Saturday; 10am – 5pm, Sunday; 12pm – 4pm. Above Ground: 1,279 Sq. Ft. Finished Total: 1,279 Sq. Ft.
1750 Wewatta Street #1100, Denver, CO 80202 (MLS# 6686651) is a Condo / Townhouse property that was sold at $775,000 on April 15, 2019. Want to learn more about 1750 Wewatta Street #1100? Do you have questions about finding other Condo / Townhouse real estate for sale in Denver? You can browse all Denver real estate or contact a Coldwell Banker agent to request more information.